Brigitte Willach: “Jean’s Garden”, 2006; on Indonesian cotton. This caught my attention in the most recent Textiles Asia Journal…. An extraordinary batik artist from Germany who has worked successfully for over twenty years creating batik in naturalistic, impressionistic and recently in abstract fashion has a special love for a group of batik artists – women and men – in central Java who have created very high quality batik in traditional designs, including for the court. The TEXTILES ASIA JOURNAL published in their Many 2017, Volume 9, Issue 1 an article written by Brigitte Willach about the Bimasakti batik group comprising about thirty members in a collective with six leading women. Too bad I cannot show any photos from this article or give you a link but you can go to textilesasia.com and order your copy of the magazine TEXTILES ASIA JOURNAL; the magazine is published three times a year by Bonnie Corwin, bonniemcorwin@gmail.com and always contains with articles about subject matters, books, exhibitions, reports about textiles from all over Asia you do not find any place else by experts in their respective field. You may be able to buy the magazine at the Textile Museum in Washington,D.C. (remember it is now located at George Washington University on 231st Street,N.W. 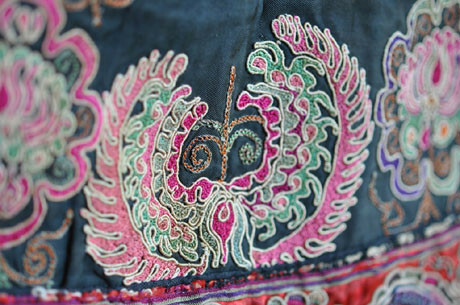 ), Asian Art Museum in SFO, Josh Graham Oriental Textiles in London, Carole Cassidy Lao Textiles in Vientiane. Given to the British Museum in 1905 by Perceval Landon (a friend of Rudyard Kipling), the museum is exhibiting the Vrindavani Vastra woven textile from the 21st of January until the 15th of August. This is a free exhibit and open to the public. This late 17th century silk textile is woven with a technique that no longer exists in India today. Extending over a length of more than 9 meters, the textile shows different scenes of the life of Krishna and a verse from the Bhagavata Purana, a 10th century text. Additional items from this period will also be displayed alongside the textile. If you want to stay informed about Asian art exhibits in North America, Asia, Europe and Australia – look it up in the Asian Art Newspaper, published every month. 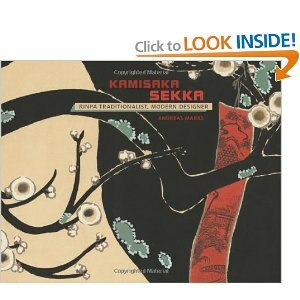 Has in-depth articles on artists, museums, cities with Asian art collections. Equally informative is TEXTILES ASIA Journal. The January edition carries a wonderful article on the significance of the zodiac animal of sheep – at the beginning of a new lunar year of the sheep, decoration on Angkorian architecture decoration and their connection and presentation on textiles; Barkcloth at the Djakarta Textile Museum; Taiwan National Museum’s exhibition of the Qipao, the Mandarin term for cheongsam, the stylish and tight fitting dress made fashionable by Shanghai society in the 1920s. This is a little bit off my subject but I receive so many calls about how to preserve and display textiles that I decided to post this article by Julia M. Brennan that appeared recently in TEXTILES ASIA (www.textilesasia.com). I have permission to show the article as it was printed in the Textiles Asia magazine. Textiles make the world go round! If you have ever wondered about the origin of the inexpensive and colorful tree of life block printed Indian cotton bedcovers – go to this Metropolitan Museum exhibit and learn all about the international textile trade shaped for centuries by the cultures of China, India, Europe, the Middle East and South America. The Silk Road already saw expensive fabrics sent to wealthy Roman patrons but this exhibit focuses on the time after international traders searched for a sea route further south after Constantinople was captured by the Ottomans Turks, — and along the way the merchants found textiles. It is rare that an entire exhibit filling several galleries is devoted to textiles. The Portuguese, the Dutch, the British, often sponsored and financed by their trading companies crisscrossed the globe and spread designs, colors and fabrics across the world. Craftsmen and artists influenced and copied each other. I have always been very partial to the palambore fabric, lush in design and colors, with exotic plant and flowers, perhaps first designed in England but made into something distinctly Indian. WOVEN CARGOES INDIAN TEXTILES IN THE EAST, by John Guy,Thames and Hudson, 1998. John Guy is a Curator in the Indian and South-East Asian Department at the V & A, London. 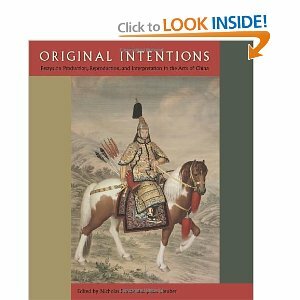 The book describes the trade in Indian textiles to Southeast Asia and the Far East. 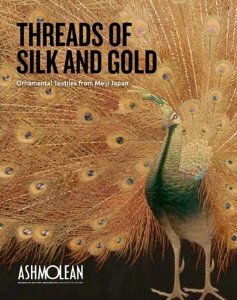 There is a wonderful photo on page 168 of a Japanese Kosode (undergarment) kimono made from an Indian palambore fabric with flowering tree design from the eighteenth century. And textile lovers should never forget the TEXTILES ASIA JOURNAL, BONNIE CORWIN, PUBLISHER AND EDITOR.